We’d love your help. Let us know what’s wrong with this preview of Star Wars Boxed Set, Episodes I-VI by Patricia C. Wrede. 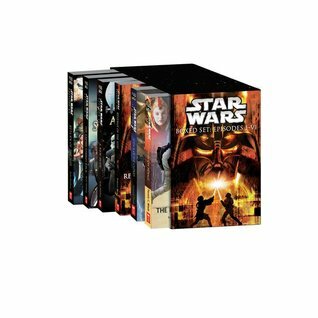 Here in one exclusive boxed set are paperback editions of each episode in George Lucass epic: "The Phantom Menace, Attack of the Clones, Revenge of the Sith, A New Hope, The Empire Strikes Back," and "Return of the Jedi." To ask other readers questions about Star Wars Boxed Set, Episodes I-VI, please sign up. I liked these because they explained the movies more and told what the characters were thinking. These book are very intense but interesting. A to read. Every book is well written if you've ever seen the movies you would see some similarities but it's also written in it's own ways so there are also differences which makes it very original. I enjoyed reading all of these books, very much. Patricia Collins Wrede was born in Chicago, Illinois and is the eldest of five children. She started writing in seventh grade. She attended Carleton College in Minnesota, where she majored in Biology and managed to avoid taking any English courses at all. She began work on her first novel, Shadow Magic, just after graduating from college in 1974. She finished it five years later and started her se Patricia Collins Wrede was born in Chicago, Illinois and is the eldest of five children. She started writing in seventh grade. She attended Carleton College in Minnesota, where she majored in Biology and managed to avoid taking any English courses at all. She began work on her first novel, Shadow Magic, just after graduating from college in 1974. She finished it five years later and started her second book at once, having become permanently hooked on writing by this time. Her interests include sewing, embroidery, desultory attempts at gardening, chocolate, not mowing the lawn, High Tea, and, of course, reading. She is a vegetarian, and currently lives in Minneapolis, Minnesota with her cats, Merlin, Brisen, and Nimue. She has no children, but as of this writing, she does have four nieces and four nephews ranging in age from seven months to twelve years old and in geographical location from Maine to Alabama.